Global study reveals six main threats are driving the decline of a remarkable seabird family. Seabirds are top predators, making them crucial indicators of the health of a marine ecosystem. And, they are sending us an alarming message—seabird populations have declined faster than other bird taxa over recent decades. Shearwaters and petrels are one of the most endangered groups of seabirds. These remarkable species are characterized by long ocean journeys for migration and feeding, and a dependence on islands to safely breed and raise young. This dual lifestyle places them at risk from many human-generated pressures. These pressures on land and at sea have led to a poor conservation status for many of the 124 species of petrels with 52 (42%) threatened species and 65 (52%) suffering population declines. A global review published this week in Frontiers in Marine Science assembled 38 petrel researchers from 34 institutions and 10 countries to produce a must-have review on future directions in conservation and research on petrels and shearwaters. We summarized the most important threats according to the IUCN Red List of threatened species. We identified six major global threats to these fragile group of seabirds: invasive species, overfishing, bycatch in the commercial fishery, light pollution, climate change, and marine pollution,” explains Dr. Airam Rodriguez from the Biological Station of Doñana, Spain and one of the leading authors of this review. The study looked at information gaps that must be filled to improve the conservation and management of petrels. The researchers found crucial knowledge gaps on basic information required for their conservation, such as the location of breeding or wintering areas, or their migratory routes. “These seabirds are highly adapted marine animals as they are found across all the world’s oceans. But they must return to land to breed, usually on isolated and inaccessible islands. This isolation alone has not been enough to protect them from the global threats that are deteriorating the state of health of the seas,” says Dr. Andre Chiaradia, another leading author in this study from the Phillip Island Nature Parks, home of 1.4 million Short-tailed Shearwaters. The researchers believe that improving conservation status is possible if we can reverse some of the main six threats. “Some of these measures are the elimination, control, and prevention of invasive species, restoration of breeding habitats, improvement of policies and regulations at the global and regional level, and the participation of local communities in conservation efforts such as seabird rescue campaigns,” adds Dr Rodriguez. “These results provide hope for these two globally important seabird groups. Knowing the primary threats allows us to take action to prevent further decline and save these species from disappearing forever. Invasive species like feral cats and rats are a key threat at breeding colonies. 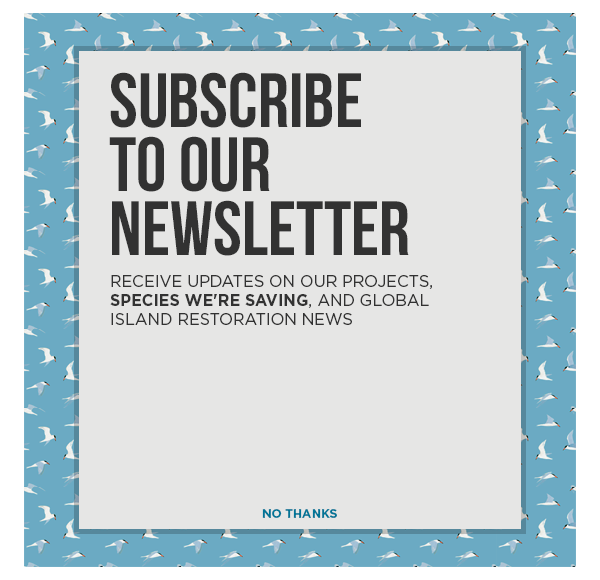 By removing invasive species like feral cats and rats from seabird islands, we can ensure safe breeding habitat and the opportunity for these remarkable species to once again thrive,” said Dr. Nick Holmes, a co-author on the paper and Director of Science at Island Conservation. The clear message that emerges from this review is the continued need for research and monitoring to inform and motivate effective conservation at the global level. Calling All Innovators—Islands Need Your Help!